For the record, arthritis is the leading cause of disability in folks over 55 years old. 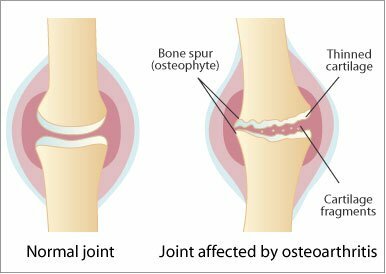 There are actually more than 100 different conditions that cause joint damage that are all forms of arthritis. The two most common are osteoarthritis OA (from bone wear and tear) and rheumatoid arthritis RA (an immune disorder). In 2010-2012, 49.7% of adults 65 years or older reported doctor-diagnosed arthritis. By 2030, an estimated 67 million Americans ages 18 years or older are projected to have doctor-diagnosed arthritis, according to the American College of Rheumatology. I live with arthritis of the hands. Like love, arthritis is a many splendored thing: knees, hips, etc. What are good exercises for folks with arthritis? How do I get relief from arthritis in my hands? Well I have a lot of pain in my knees. What can I do? Thanks for your comment There are a ton of suggestions in the post. You might try some of them. You need to see a doctor. These suggestions are for arthritic pain. I am not a medical practicioner. There is a lot talk about arthritis. What about tendonitis? Thanks for your comment, Gail. As an arthritis sufferer, I write about what I know. Here is a link for the Livestrong site on arthritis vs tendenitis.